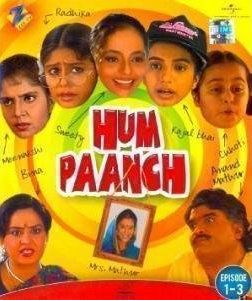 Let us continue our quest to review Hindi Sitcom Hum Paanch by exploring Episode #7 of the same. The episode is focused on Radhika and her experiments of living without the hearing aids. Radhika, one of the wise and studious member of Mathur family was not happy for the fact that she had to be dependent on her hearing aids. But as she is having hearing disability (not 100%), she was unable to find a solution. One day though, when she read about lip-reading and its benefits, she thought she just found what she is looking for! She decided to give this art a chance. When she have informed about it to her sisters, they didn’t welcome the idea much. 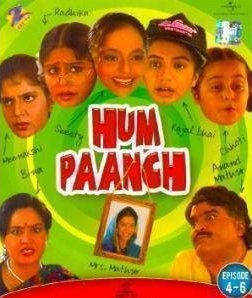 Though the youngest sister approve this approach by referring the use of lip reading in some Hindi films. Kajal however rejected the idea. The dialog about Shridevi between Kajal, Sweety and others, is really nice. Also the question raised by a sister about, what Radhika will do when someone speak behind the back, how lip-reading can help in such situations?! It is genuinely asked question. Despite of being opposed by her sisters, Radhika decided to avoid using hearing machine that day and she left for the college. A couple of youth are standing at the bus stop from where Radhika needs to pick her bus. One of them named Anil fall for Radhika since a while but was unable to get courage to tak to her yet. Encouraged by his friend, he tried talking Radhika. As Radhika was unable to hear and understand what Anil have said, she replied as per her understanding. The things go wrong from this point. Anil consider it as acceptance of his love by Radhika. He then writes a letter and on his efforts to send it to Radhika, he meets Kajal and her youngest sister! By reading the love letter, they thought that Radhika is also in love with the guy and they decided to take the matter in their hands and convey about the same to their parents! The comedy of errors continue from this point onwards and it is a genuine watch. The script is above average. The dialogs are first rate. The comic timing of Ashok and Shoma is a delight to watch. Also the dialogs written for the youngest sister are nice. It will surely irk smile on your face while watching it. Almost all the episodes are having indoor stuff explored, here we got to see a very little stuff explored outside of the Mathur’s home. The cinematography is good. The girl playing the youngest sister need to work on her dialog delivery, she was not that natural. The actresses who played rest of the sisters, are good performers. Amita Nangia and Rakhi Vision are good performers as well. The actors playing youth are not first rate, but they are not bad too. One of the good quality of writing is, the episode doesn’t try to make fun of someone’s disability. Overall an episode with some genuinely funny scenes, not so great but watchable along with the entire family.